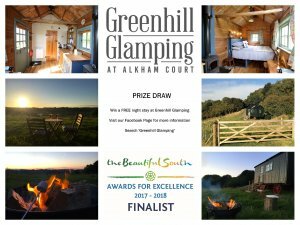 Prize Draw at Greenhill Glamping! We are offering a prize draw to win a ‘free night’ at our shepherd’s hut to celebrate becoming a finalist in the ‘Glamping Business of the Year’ at the Beautiful South Tourism Awards for the South East Region. This prestigious awards ceremony is taking place at the Grand Brighton on 29th November. The draw closes on 19th November 2017 at 11.59 p.m. GMT so don’t miss out! The winner will be chosen at random and notified by Facebook Message within 10 days.